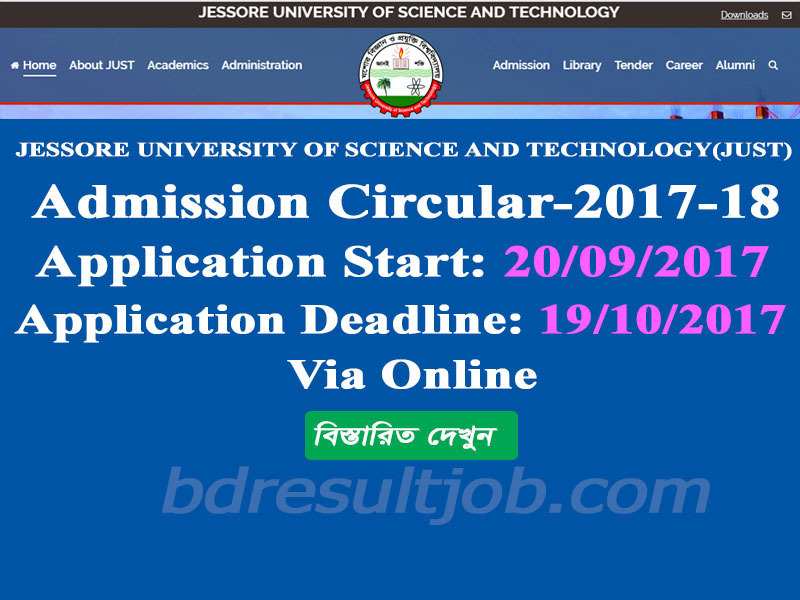 Jessore University of Science and Technology (JUST) Admission Test Circular 2017-2018 has been published. 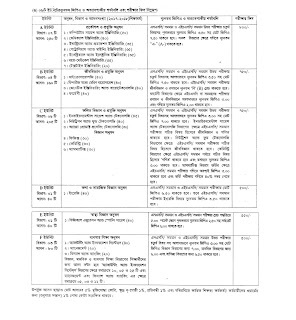 Jessore University of Science and Technology (JUST) Admission Apply instruction, Payment Instruction, Admit Card information, Seat plan, Admission test mark distribution and admission test result has been published. d. Type Application ID (which you found online appliaction form). e. Input Your amount Amount (please see unit amdission fee). After complete the payment successfully reserved the transaction ID and visit http://just.ambersoftwaresolutions.com/ put your appliaction ID and Transaction ID and submit and dwonload your admit card. Visit http://just.ambersoftwaresolutions.com/ put your application ID and Transaction ID and submit and dwonload your admit card. 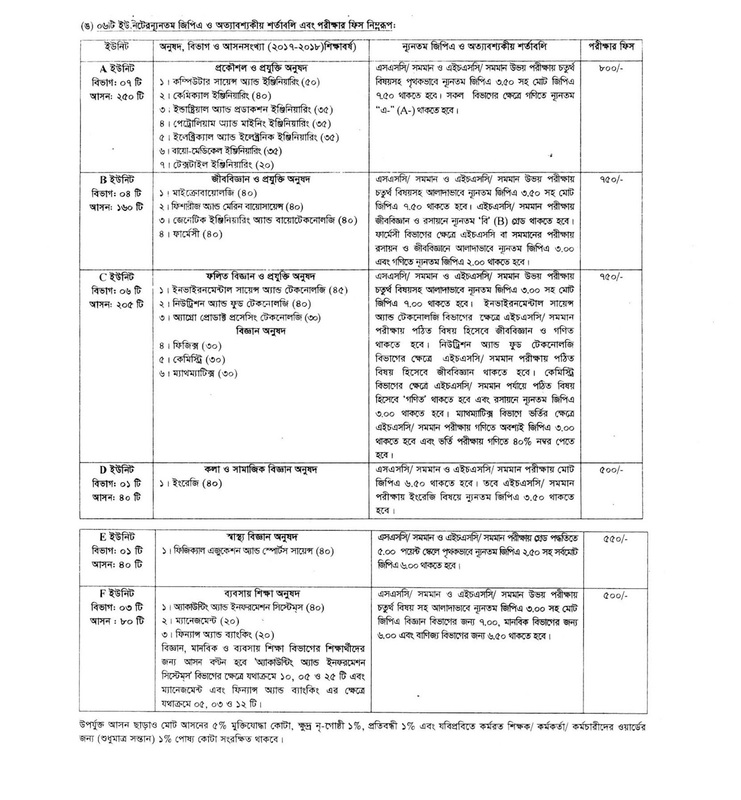 Jessore University of Science and Technology (JUST) Test admission authority will published seat plan before 03 (three) days on Visit http://just.ambersoftwaresolutions.com/ or http://just.edu.bd/. 12 November, 2017 will published Admission Test Result. Any applicant can download and view from Jessore University of Science and Technology (JUST) official website http://just.ambersoftwaresolutions.com/ or http://just.edu.bd/ search their Admission Test Roll Number. Tags: just edu bd, just ambersoftwaresolutions com, Jessore University of Science and Technology (JUST) Admission Circular 2017, Jessore University of Science and Technology (JUST) Admission Test Result 2017, Jessore University of Science and Technology (JUST) Admission waiting list 2017, JUST Admission Circular, JUST Admission Notice, JUST Admit Card Download 2017, just Seat Plan 2017, just Admission Mark Distribution, Jessore University of Science and Technology (JUST) Mark Distribution 2017, JUST Admission Test Result 2017, JUST Undergraduate Online Application. 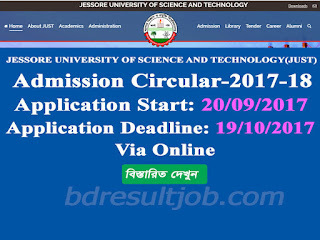 Bangladesh Education and Job Portal: Jessore University of Science and Technology (JUST) Admission Test Circular 2017-2018 has been published.